Discussion in 'Flotalk' started by Zippa, Jan 29, 2019. Hey there! Flo got a bit boring recently, so i wanna spice things up a bit again. Write your Class, Name and lvl. Every Player who participates in the Event will recieve 1 x Slate Piece of Ancient no matter what. Exception: Disqualified players wont get any rewards. - 4 Fusion Each Piece, if you have more you will be Disqualified. - No Buffs from other Characters, everything has to come from your own character. - Cs Dresses are allowed. - Changing gear during the pvp / lending gear is forbidden. You will have to keep the same eq you started your 1st pvp with. Addition: Unsportsmanlike behavior will result into a disqualification. 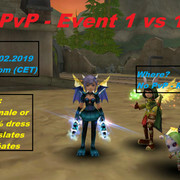 The Event is about fun and showing your skill, if your opponent has a bad day or bad fight, dont troll, annoy, or flame them. If I'm getting to annoyed of your trashtalking, i'll give out a warning. If my warning is ignored, then the event is over for you - Disqualified = no rewards. If a PvP is Longer than 10 minutes / or players drag out PvP's on purpose, both players will loose this round. PvP's are best of 3 Tournament Style. Logging out / connection is equal to Loosing. Be there at Friday 18.30 / 6.30pm (CET). vjdnvdsf and Shadow like this. Signing up for the Event is over. There arent any slots avaible anymore. Since there is a bit of confusion going on. With "Changing gear during the pvp /lending gear is forbidden". It is allowed to change your Weapons, Jewellery, dresses and hats during a ongoing PvP. Its simply forbidden to change your eq by trading with another char during the event. The Eq you have in your 1st pvp, will be the eq you have in every continious pvp. If you loose your PvP, its not over already for u, so i dont want players to be dissapointed when they face a to strong enemy, or are just unlucky in their pvps. I Added a Looser Bracket, so if you loose your round in The normal PvP tree, you still get another chance. This Tree only features the 3rd place. 1st and 2nd place will only win through the main Tournament Tree. The Looser's Bracket will only be a best of 1. Otherwise the event would take to long. Good luck in your PvP's, See you until next Friday!